Mr. Bard arrived in Southern California in 1865. He was sent to this area as a representative of Thomas Scott, acting Assistant Secretary of War under President Lincoln and he was also president of the Pennsylvania Railroad. Mr. Scott’s responsibilities in the east made it impossible for him to oversee his land holdings in the west. Thomas Bard was sent to the area to manage the 350,000 acres that Mr. Scott owned. While taking care of Mr. Scott’s property in the Ojai Valley, Mr. Bard quickly became a pioneer in the development of oil fields. He was living in a charming Swiss chalet that Mr. Scott had built for him near Sulphur Mountain, one-quarter mile from the Arnaz adobe. Mr. Bard was also here to drill for oil, which he did with very little success. When he did find oil, it was not of a good grade, so it was decided that any fortune would have to be made in the sale of land. It then became the responsibility of Mr. Bard to subdivide the Ojai Valley for Mr. Scott. The land was sold in small parcels and large ranches. 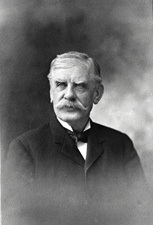 In 1868 Thomas Bard was elected supervisor for the county of Santa Barbara and was instrumental in forming the county of Ventura in 1873, which had originally been part of Santa Barbara County. Mr. Bard had a varied political career that influenced much of the development of the west, including agriculture, ranching and railroading. In 1872, he partnered with Royce G. Surdam to purchase 1,400 sheep to graze on his land in the Ojai Valley. In 1900, the Republicans backed him for U.S. Senator. In those days, senators were selected, not by the people, but by the state Legislature. Mr. Bard was selected and served a six year term. There had never been a senator from Ventura County and the excitement caused the county to celebrate with bands, cannons booming and church bells ringing. Thomas Bard was a remarkable man, quiet and direct, his influence reached far and wide, even to the construction of the Panama Canal. His faith in what he was doing set an outstanding example for all of Ventura County. Mr. Bard died in his final home: “Berylwood” in the town of Port Hueneme, which he had founded. A 100 year celebration is in the planning. You can keep track of that and other events/happenings at the Friends of Bard (Mansion) website. Not sure what “moderation” means!